My heart ached as I read the stepmom’s plea for help. I understood her feelings. It’s not unusual to feel lost, uncertain, and discontent in our stepparenting role. But we don’t have to stay stuck there! I didn’t walk into adulthood with aspirations to be a stepparent. I doubt you did either. Parenthood is meant to happen within the framework of a single marriage, where a child’s own father and mother work together to provide a loving, secure environment. But that doesn’t always happen. My husband, Randy, and I raised five kids together in a stepfamily. Now, with only our mutual child left at home, we are in a quieter season of parenting. I often look back to our early years together and consider the differences between blended family and traditional family life. There’s really no comparison. The dynamics of a traditional family don’t even come close to the complications that stepfamilies face. That doesn’t mean we can’t enjoy loving and meaningful relationships in stepfamilies or find joy in our stepparenting calling. But we will have to work harder, relying on God’s help to achieve that. It’s not going to happen naturally. We must accept the calling first in order to find joy in it. Maybe you wanted a child of your own, but God said no. Maybe you started marriage in a traditional family but lost your spouse unexpectedly. The stepparenting role that remarriage has created for you is unplanned and disorienting. Perhaps you struggle raising stepchildren alongside your own children following a divorce. Will you accept the calling God has given you to be a loving, Christlike influence to a child you didn’t birth? 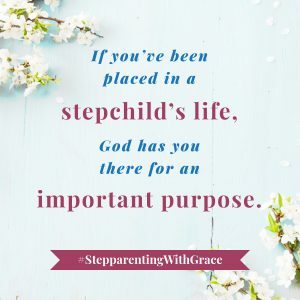 Well-known pastor and author Andy Stanley says, “Your greatest contribution to the kingdom of God may not be something you do, but someone you raise.” If you’ve been placed in a stepchild’s life, then God has you there for an important purpose. Look at yourself through God’s eyes. When feelings of uncertainty or inadequacy arise, take time to look at yourself through God’s eyes. God saw Abram as “the father of many nations” at ninety-nine years old with only one son (Genesis 17:4). God saw Mary as the mother of the Savior when she was yet a girl. God sees you as a capable, loving parent who can make a difference in this child’s like like no one else can. Above all, I pray you’ll embrace the important calling you’ve been given as a stepparent. Thank you for this amazing word of encouragment!! God bless! You’re welcome, Rozanne! I’m glad you found it helpful! Blessings to you and your family!